On December 4, 1915 Joseph Gorman of Ottawa graduated from the Stinson Flying School at San Antonio, Texas, and returned to Canada in order to sign up with the Royal Naval Air Service (RNAS). He was the first graduate for twenty-one year-old Marjorie Stinson, the instructor who taught him to fly in the record time of two weeks (totalling about four hours of flying time). Some years later Stinson reflected that “perhaps I might never have begun teaching men to fly had it not been for a group of youngsters who feared the war would be over before they could get into a fight.” Unable to get sufficient hours in at the Wright Flying School at Dayton, Ohio, Gorman and three other Canadian men wired Stinson “asking if I would take them on. I wired back a ‘yes’ and down they came before I was quite ready for them.” Stinson’s story, which will make an appearance at the War in the Air exhibition curated by John Maker at the Canadian War Museum in 2016, provides a fascinating glimpse into the excitement and sense of possibility generated by the confused scramble of wartime regulators to make sense of new technologies. Together with her sister Katherine and brothers Edward and Jack, Stinson was a member of what came to be described in the press as the “Flying Family.” Katherine was the first member of this family who learned to fly, in 1912 under the tutelage of Max Lille. In May 1913 she incorporated the “Stinson Aviation Company” to manufacture aeroplanes, with capital stock of $10,000, herself as president and her mother, Emma B. Stinson, as secretary and treasurer. 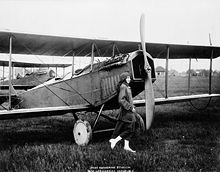 Within a month Katherine had bought a Wright model “B” biplane to develop her flying skills and the company began to grow. The following year Marjorie asked her mother for $450 and travelled by train to take lessons at the Wright School. After 4.5 hours in the air she earned her Aero Club of America Pilot’s Certificate No. 303 (dated August 12, 1914), performed some exhibition flights, and then became the main flying instructor at the new branch of the family business, the Stinson School of Flying. Her first graduate was Gorman, who gained Certificate No. 371. That only 67 other people (all men) had earned their licences between Stinson and Gorman gives a sense of how much aviation at the time operated on the principle of the newly minted pilot teaching the next one in line how to fly. Marjorie also taught both of her brothers: Edward in December 1915 and Jack in January 1916. In Canada, Katherine, dubbed “the Flying Schoolgirl,” is the better known sister: she performed exhibition flights in 1916 and 1918, was the second person to carry airmail in Canada (after Captain Peck and Corporal Mathers), and the first person to fly the mail in the west, an event that was commemorated on 9 July 2006 with a re-enactment flight undertaken by Audrey Kahovec, a flying instructor with the Edmonton Flying Club. But Katherine’s younger sister Marjorie had an arguably greater impact on Canadian aviation in the First World War. Although aeroplanes were very much a new and unreliable technology, with their underpowered engines, experimental designs, and long record of fatal crashes, Canadian authorities were both unsure about and terrified by their potential wartime role. On 17 September 1914 Order-in-Council P.C. 2389 imposed significant restrictions on private flying, including prohibitions on flying within ten miles of wireless stations and around most of the main towns and cities. Since exhibition flying in front of large crowds was the way in which most pilots made the money to sustain their costly activities, this Order-in-Council effectively grounded them, and Americans were swiftly told to stop entering Canadian airspace unannounced. Canada had no air force and it was not clear what role flying might play in the Great War until February 1915 when the British War Office asked the Canadian Government to find men to enlist in the Royal Flying Corps (RFC). Two months later the British Admiralty asked the Department of Naval Service in Ottawa to do the same for the RNAS. Both services required potential applicants to already possess a pilot’s certificate. This stipulation was a gift for the Stinsons. At the exorbitant cost of $1 per minute for flying time, it was not surprising that only eight Canadian men (and no women) had received their pilot’s certificates before the declaration of war. Feeling a misplaced sense of urgency and finding almost nowhere to get flying training in Canada (only the new Curtiss School in Toronto actually functioned and it filled up with trainees almost immediately), men rushed south where their demands were met by private corporations. Three flying schools quickly gained good reputations: the Wright school, the Curtiss school and the Stinson school (other schools lacked aircraft or had instructors who had never actually flown). Although the exact numbers of Canadian men who enrolled at these schools is unknown, 110 of them gained pilot’s certificates. By the time the RFC and RNAS dropped their requirements and started training applicants themselves, the Stinsons had turned out 23 licensed Canadian pilots. Only the Curtiss School at Newport News in Virginia produced more. Building on her initial success with Gorman, Marjorie Stinson worked flat out, sometimes spending more than six hours a day aloft (landing after short hops to load up the next keen pupil). The School was characterised as one with “a reputation for daring, yet also caution and exceeding care as to details connected with flight” and it almost exclusively trained Canadians. Stinson commented that they must have had “the letter-writing or telegram-sending habit” because more and more found their way there from Toronto, Montreal, Ottawa, Prince George, Calgary and Regina, among other places. This influx of Canadians did not pass without comment. The USA was not yet at war and the San Antonio Express felt the need to clarify that “The Stinson school doesn’t take Canadians for pupils because they are Canadians, but because it is these men who apply for instruction mostly, though there are five Texans taking a course, if Canadians come down here and ask to enroll, why should the Stinsons refuse them?” Why indeed? The Stinson sisters, like their compatriot Ruth Law, were caught up in romantic notions of combat and were described in various memos and letters (now held in the Marjorie Claire Stinson Papers at the Library of Congress) as being “patriotic.” They were undoubtedly entrepreneurial women who built up a well-respected family business. From 1915 to 1917 their patriotism manifested itself in support for the Canadian war machine (through which they were also making money). As soon as the USA entered the war it took over military flying training and so the Stinson School closed down. Both Marjorie and Katherine then tried to enlist as military pilots, with the support of men they had worked with for years. For example, Captain Clinton G. Brown, in the Office of the Director of Military Aeronautics in the War Department in Washington, took pleasure in recommending Marjorie to be enrolled in the Naval Reserve Flying Corps, while Charles Fowler, of San Antonio, Texas, wrote to the Honorable Jim N. Mayes, at the US House of Representatives, to point out that if Katherine were a man she would be flying at the French Front with the LaFayette Escadrille (a French air squadron largely made up of American volunteer pilots) but that because she was a woman she was not permitted to “do her bit” in that way. It was to no avail: the Stinson sisters were not allowed to enlist as military pilots. The dominant stories of aviation and the First World War are profoundly masculine tales. They combine technological innovation, individual acts of heroism personified by the flying ace, and a fresh, horrifying perspective on warfare. The present-day context retains much of the same flavour: reassuring claims about drones and “surgical” airstrikes, decades of debate over opening combat roles to women, and transnational responses to what are defined as global threats that, taken together, can present an almost seamless logic of militarisation. The accounts of Marjorie Stinson’s efforts humanise those tales in intriguing ways, revealing anxious men, transnational entrepreneurship, the “power of disbelief,” and military confusion. It was galling for Marjorie that she was good enough to train men to fly but not allowed to take what she argued was her rightful place beside them at the Front. Stinson’s story is an individualised example of “World War Women,” the title of the exhibition currently on display at the Canadian War Museum curated by Stacey Barker and Molly McCullough, which speaks to the ambiguities, concerns, and excitement over what women could and should be allowed to do in wartime. It remains a relevant tale for today. 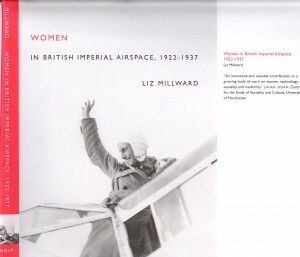 Liz Millward teaches Women’s and Gender Studies at the University of Manitoba. She is the author of Women in British Imperial Airspace, 1922-1937 (Montreal: McGill-Queen’s University Press, 2008) and Making a Scene: Lesbians and Community across Canada 1964-84 (Vancouver: UBC Press, 2015).
. Marjorie Stinson, “Wings for War Birds: How a Girl Taught Fighters to Fly.” Liberty, 28 December 1929, p. 25.
. Aero and Hydro, May 17 1913, p. 128 and p. 131, and June 21 1913, p. 228. For an overview of the Stinson family see John W. Underwood, The Stinsons: The exciting chronicle of a flying family and the planes that enhanced their fame (Glendale, CA: Heritage Press, 1969).
. Sydney F. Wise, Canadian Airmen and the First World War: The Official History of the Royal Canadian Air Force. Volume 1 (Toronto: University of Toronto Press, 1980), p. 24.
. George A. Fuller, John A. Griffin, and Kenneth M. Molson 125 years of Canadian aeronautics: a chronology, 1840-1965 (Willowdale, Ont. : Canadian Aviation Historical Society, 1983), p. 77.
. At the Wright schools: Dayton, 19, Augusta, 21, Mineola, 4 and Hempstead Plains, 1; at the Curtiss schools: Newport News, 27, Buffalo, 3, and San Diego, 1; at the Stinson school at San Antonio, 23; at the Glenn Martin school at Los Angeles, 4; at the Thomas school at Ithaca, N.Y., 4; at the Burns school at Los Angeles, 2; and at the Christofferson school at Alameda, California, 1. Ron Dodds, “When the Canadians Took Over U.S. Flying Schools,” Flight Magazine, February 1969, p. 29.
. “Little San Antonio Girl Lends a Mighty Hand to the English in the War,” San Antonio Express, 12 March 1916. Box 35 and Box 37, Marjorie Claire Stinson Papers, Manuscript Division, Library of Congress, Washington, D.C. The “power of disbelief” is the idea that groups with little or no power (such as women under patriarchy) can destabilize taken-for-granted claims by a dominant group that its power is natural and legitimate (such as the military’s refusal to enlist women in combat roles) by refusing to accede to them. Robyn Rowland and Renate Klein. “Radical Feminism: History, Politics, Action.” Radically Speaking: Feminism Reclaimed, Eds. Diane Bell and Renate Klein (Melbourne: Spinifex, 1996), p. 34.